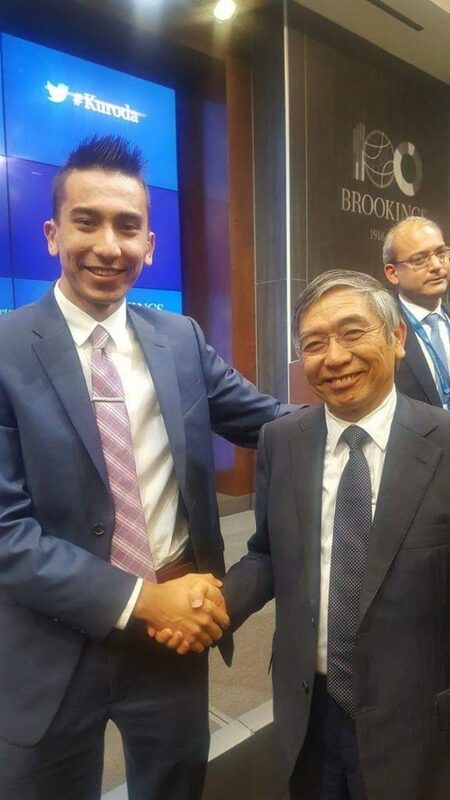 After meeting the former chairman of the Federal Reserve, Bernanke, last October – I met the current Bank of Japan governor, Haruhiko Kuroda, this October. I asked Mr. Bernanke a question and did the same for Kuroda. This time, I also got a handshake. The Brookings Institution, a nonprofit public policy organization, hosted a conversation with the governor on Saturday, October 8. The event was held in Washington D.C., where the think tank is based. The event was nearly 1.5 hours long, starting 4:00 P.M.
David Wessel on the left. 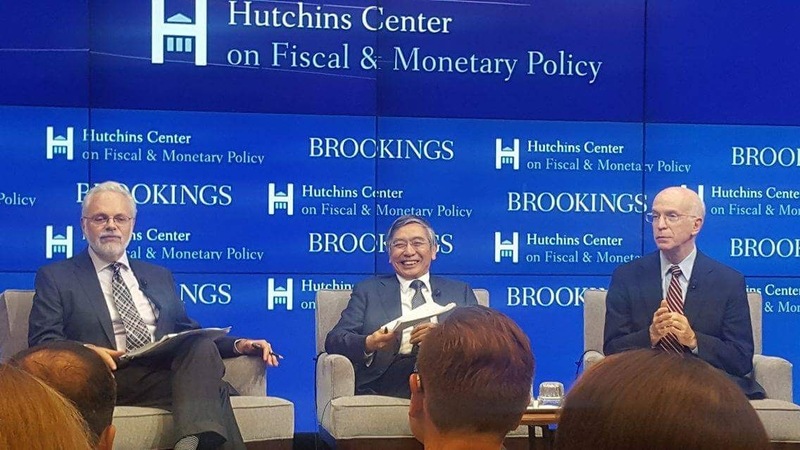 Haruhiko Kuroda in the middle. Alan Blinder on the right. I live in New York City. It took about 10 hours on a bus to go to D.C. and come back, as well as about $70….all for an hour of event. At least I got some work done on the bus. Time well spent. It was all worth it since I’m in love with economics and finance. Kenneth Tjonasam, also a student at Baruch College and the smartest person I ever met, went there as well. He asked a question before me. 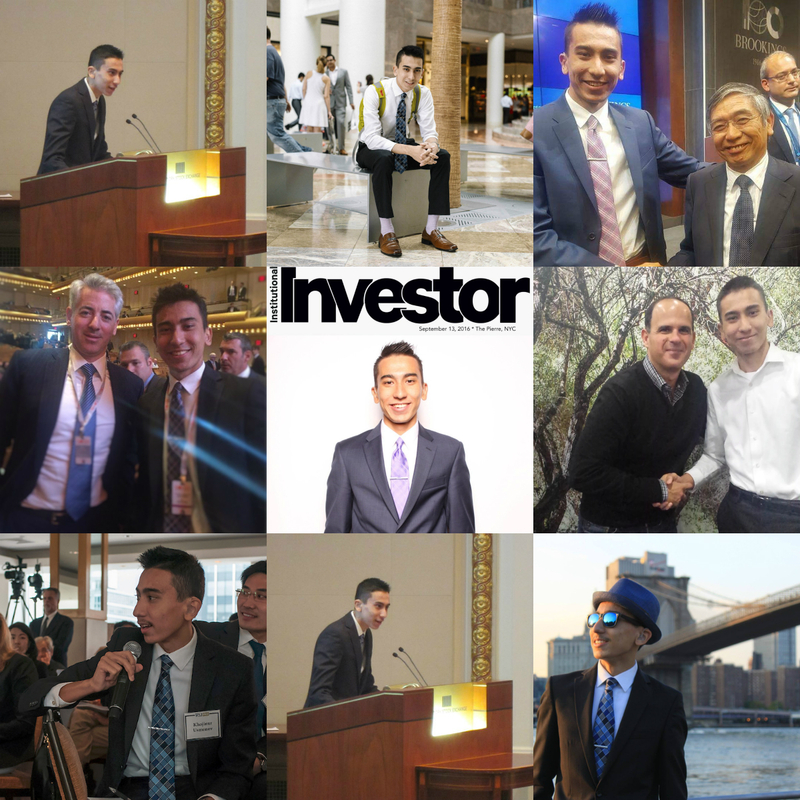 This time, I didn’t blank out, as I learned from my first experience meeting a high-profile person. I asked “What do you think is the biggest threat to the financial markets today? Lack of liquidity? Regulations? Algos and HFTs? Or whatever?” (I should have said “Or something else?”). There’s video available below. I ask the question at 1:17:55. Kenneth asks his question at 1:17:18. I find this question quite fascinating, considering regulations and algos/HFTs (technology) are partly responsible (or you can argue entirely responsible) for the lack of liquidity. 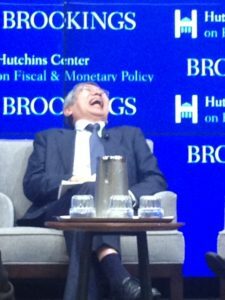 Did Mr. Kuroda answer my awesome question? No! 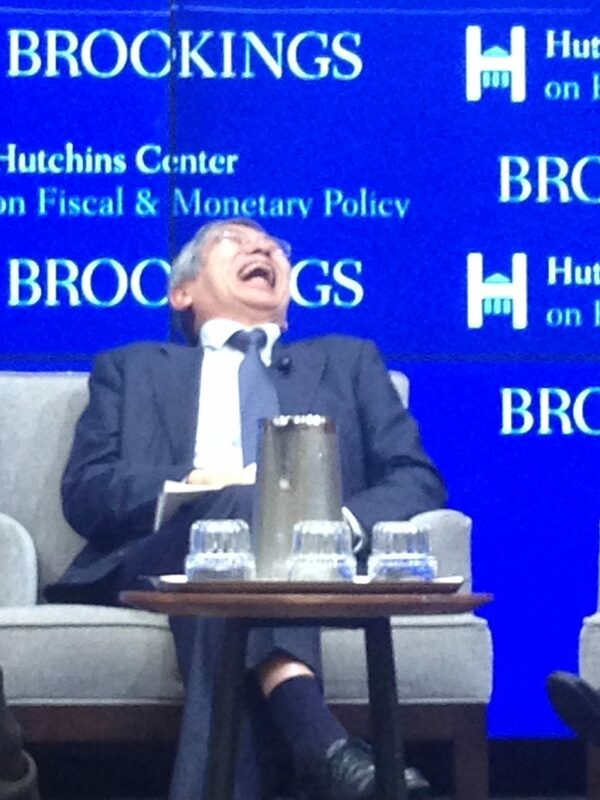 After Kuroda answered the first 3 questions, the moderator, David Wessel, took 4 more questions. I was the 6th, which is my favorite number. When it came time to answer my question, David said “We don’t have time for more questions.” (1:26:05). I’m sure Kuroda is happy for dodging my question. Besides the disappointment of time, the experience was great. I’m thankful to the Brookings Institution for the opportunity to be at the event. It’s only matter of time before I’m on stage there and a moderator asks me questions. Who’s the next high-profile person I will meet? Janet Yellen? ….and Kuroda is really short, with a perfect smile. A conversation with Governor Haruhiko Kuroda, Bank of Japan. A decline in CMBS markets have led to new ways of raising capital for US real estate players — and opening doors of opportunity for new waves of capital. The EB-5 visa program has been a popular source of capital but concerns of fraud have put the program under a microscope and could end this year. With fewer financing options and high interest mezzanine loans, real estate businesses are looking elsewhere for cheap capital, namely Israeli bonds. Israeli bond issuance takes four-to-five months, with future issuances taking less than a month — a game changer for players who need capital fast. To keep reading more, the article is available on Seeking Alpha. Or copy/paste: http://seekingalpha.com/article/4009155-industry-game-changer-tel-aviv-stock-exchange-changing-us-real-estate.